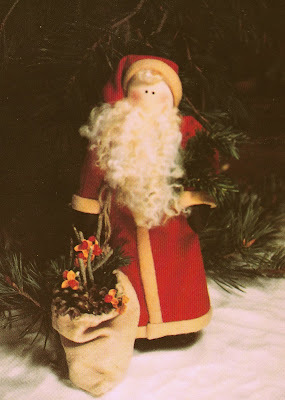 The year was 1987, it was at that time I decided to market the idea rather then the finished product in pattern form. I began with 3 patterns, the 1st three shown below. I printed them at the local Kinko's, pasted on a photo and invested in 1000 zip lock bags. I then took the 3 patterns plus 2 screaming little ones over to a great little craft/gift shop in Boone Iowa called Down Memory Lane. I wanted to get the owners (Nancy Hughes) opinion of whether she thought the patterns had any chance of selling. Nancy was busy with another customer so I laid the patterns down on the cutting table and went about my way to corral my 2 children so they didn't destroy the place. Once Nancy had a free moment, I went back to the counter to get the 3 patterns only to find they were gone & in the hands of a customer...made my day & the rest is history! My kitchen table was my "studio", a rescued desk from the University's garbage was my "office" and the stair steps leading upstairs was my "warehouse", small and humbling BUT it worked! The pattern photos were taken with borrowed camera & lighting equipment from the universities photo department and my darling husband was the photographer!! Sorry contest has ended, winner will be announced Monday morning! Can you tell me the pattern titles of any or all of those first three patterns (the photos without titles)? Time to dig out those vintage patterns you have tucked away ladies! If you know any of the titles, leave a comment. If you don't know the names, well shoot you can always guess! Comments with correct titles will go into a pot and one winner will be drawn from the pot. 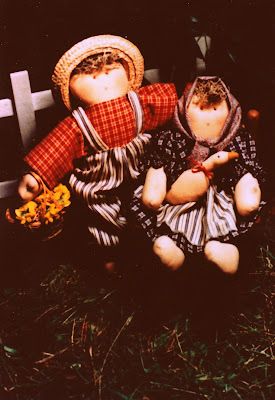 The winning name will enjoy a $50.00 shopping spree at http://www.countrystitchesonline.com/. Contest ends on Sunday evening at 6:00 PM CST. Winner will be announced Monday morning. To "thank you" for 23 wonderful years in the pattern business I will be offering free shipping on Saturday, March 13th for 23 hours. Offer begins at 9:00 AM CST Saturday, ending at 8:00 AM Sunday morning CST. Remember we turn our clocks ahead this weekend! This offer applies to domestic Internet orders only, thanks for understanding. As I was preparing this post, I laid the photos out and showed them to my DH...and he even remembered the pattern title of the very 1st pattern design. We sat and reminisced, and mainly critiqued his photography skills, and laughed a whole lot. I should probably mention he wasn't schooling to be a photographer...it's probably best he sticks with designing & engineering machines, don't ya think?? Congratulations on 23 years and here's to 23 more! Congratulations on your 23years of business! That's awesome! I have no idea what the pattern names may be but they sure look cute! Thanks for the free shipping. I'm assuming you meant March 13th? Congrats on the 23 years! I just love all of your patterns and the old one are super cute. 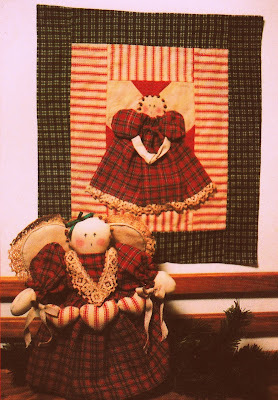 I don't remember the names of these patterns, so sorry, but they are very cute. I am going to be guessing here:#1 could be called Miss Bunny, #2 could be called Peter and Mama, #3 could be called Somebunny loves me. I can't wait until tommorrow for the free shipping! Thanks so much and can't wait to see what your next 23 years will bring us. Pattern #2 with the two bunnies is: Surprise For Mom. Congratulations on your 23 years...with your talent you will definitely see many more years of success!!! Congratulations on 23 years of being in business! I loved reading about how your business started out. "I will be offering free shipping on Saturday, March 13th for 23 hours. Offer begins at 9:00 AM CST, ending at 8:00 PM CST"
That is only 11 hours. Did you mean 9:00 AM (Sat) to 8:00 AM (Sun)? Just want to be sure I order at the correct time! To add to the confusion (sorry) Daylight Saving Time kicks in on Sunday, so I think we lose an hour, but I could be wrong. 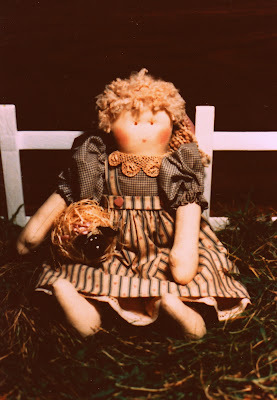 i wish i could remember how many of those dolls, Best Friends, that i made and sold. i loved your patterns. thanks! You sure have come a long way girl! Congratulations on 23 years of wonderful patterns. May you have many many more. Isn't it amazing how things change over the years. I always love looking at the vintage years which some I like better then the modern day look. Congradulations on the 23 years. Take care. The second pattern is called; Surprise for Mom. I think I saw one of those patterns at the thrift this week and never connected it to yours, lol. I realized I should have added some mediums since I drop mine all the time, so will be taking advantage of the free shipping. Congratulations on 23 years. I have see you name in quite a few of my older magazines. And I remember the bunny days in the 80's. Hi Brenda, wow, 23 years, that is amazing! I remember one of them as Busy Lizzy and Love Bunny, maybe Bunny Friends, not sure......lol...... can't get past the twenty three years!!!! Congratulations! 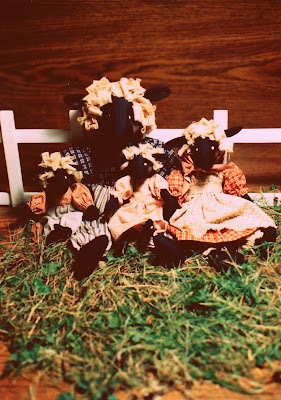 I don't remember the names of the patterns but I have the bunnys and the angel and the sheepies. I'll have to go looking for them, I made the bunnies a gajillion times cause they are so cute! And I still have mine. They come out during Spring every year! Can it be that long...23 years already...you go girl!!!!! I'm quite sure the third pattern is Best Friends...still search through my stash for the others. Just curious...Do you have your own warehouse setting now? How many full time employee? Perhaps you can post some pics...I can't be the only curious(nosey) one!!!! I attempted to post a comment twice now, I hope this one takes. First pic, #101 Love Bunny, Second pic, #102 Surprise For Mom and third pic, 105 Best Friends. Best friends is the name of one og the patterns, I even tried to stitch it but my sewing abilities were not up to par. I tried to make it for my upcoming baby nursery, she will be 22 next month. 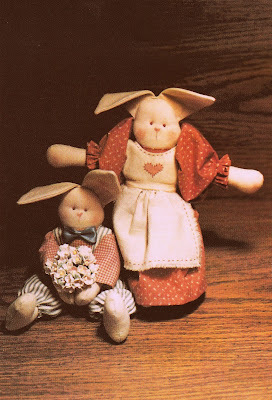 According to the Des Moines Sunday Register (April 12, 1987) article that I had tucked in my "Love Bunny" pattern, the 3 are LOVE BUNNY, SURPRISE FOR MOM and BEST FRIENDS. 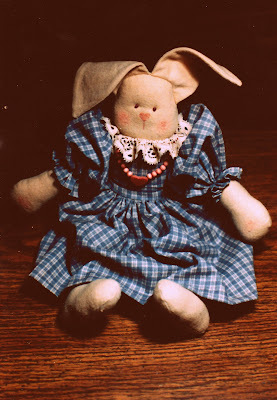 My Love Bunny pattern cost $4.50 and I'm sure I bought it at Down Memory Lane. I see by the article that you also sold finished items with clothing colors of dusty rose and Williamsburg blue. We've come a long way! Obviously I have been a fan and customer for a long time. I miss being able to stop at your shop in Storm Lake to see what's new and pick up supplies. Thanks for keeping the creative juices flowing! Congratulations on 23 years!! I wish you many many more years of success. 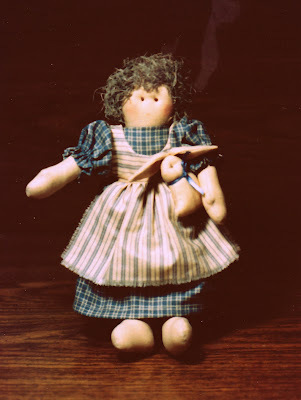 And Vonna has already stated that Pattern #3 with little girl holding bunny is BEST FRIENDS. Combing through the stash is such a wonderful way to enjoy a rainy Sunday...I found #1 (Love Bunny) and #3(Best Friends). I'm so proud of myself...did a little spring cleaning and found the patterns!!! Keep up the wonderful work you have been doing all these years! How about posting some pics of your office space and staff?? ?